The satanic takeover of the Catholic church was prophesied in the third secret of Fatima, which was never publicly released because it was too explosive and damaging to the church (though the Vatican did release a fake third secret, in the vain hope of suppressing the truth). The real third secret of Fatima essentially laid bare the fact that the Vatican would be infiltrated by satanic forces. This has already happened and there is a very real spiritual war for people’s souls currently underway on the planet. What better way to take down Christians, than taking over the church and manipulating Christianity en masse and by stealth? As Children of God, we have the right to ask God to help us in the battle of Armageddon and help wipe out the dark forces of planet Earth. From a spiritual perspective, this is called binding and judgement. This is a process that can only be accomplished through the power of heartfelt prayer and the power of Christ which is inherent in you. Jesus acknowledged that “I of mine own self can do nothing; it is the Father in me which doeth the work.” Similarly, in spiritual warfare, our human selves are not the doers, but it is the power of Christ through us on the physical plane that literally compels the power of God to swing into action. This is the one true refuge and shield from the darkness – the power that will send dark spirits and the forces behind the cabal running like cockroaches when the light is switched on. Heartfelt prayer is the key to this process, because we have to pray to God to intercede for us in the battle between good and evil. Earth is a planet of free will, and God and His entire hierarchy of light respect this. There are a number of important steps one can take to improve the power and effectiveness of one’s prayer, and the more you can put these into action, the greater the response from God. In the process of binding and judgement, there are four critical steps. 1. Protection. Darkness does not like being attacked – especially when it comes to being hauled off the planet for good by forces of light. So the first thing to ask God for is protection. If you are familiar with the hierarchy of Heaven, Archangel Michael is the best Archangel to go to for protection. He is able to quickly dispatch and reverse any attacks of darkness and provide complete protection in performing this work. It is also worth praying for the armour of God, which is discussed in Ephesians: the belt of truth, breastplate of righteousness, feet shod with peace, shield of faith, helmet of salvation, and the sword of the spirit/word of God. 2. Binding and judgement. There are two steps here. Binding refers to the complete restraint and detention of dark forces. Once they are bound, they are no longer able to act as the more powerful forces of light hold them. It’s almost the equivalent of being locked in a spiritual jail cell. The second step here is judgement, which is an action of God that essentially calls the dark forces to account on their actions. God is fair and just in His judgements, and the dark forces are given ample opportunities to turn to the light and do the right thing – and at the level of the fallen angels, judgement is usually meted out in equal measure to the good they achieved as angels before the war in heaven and the fall of the angels. This is the law of karma, which is an impersonal universal law that dictates “as you sow, so shall you reap”. The weight of karma will indeed come full circle to those who sow seeds of darkness, evil and destruction. This is not a process of revenge or retribution as understood by some people, but an act of tough love so that souls and other life steams will realise the error of their ways and hopefully turn to the light – or potentially face the “second death” (the first death being the fall from heaven, and the second death being the snuffing out of their soul or life stream completely). 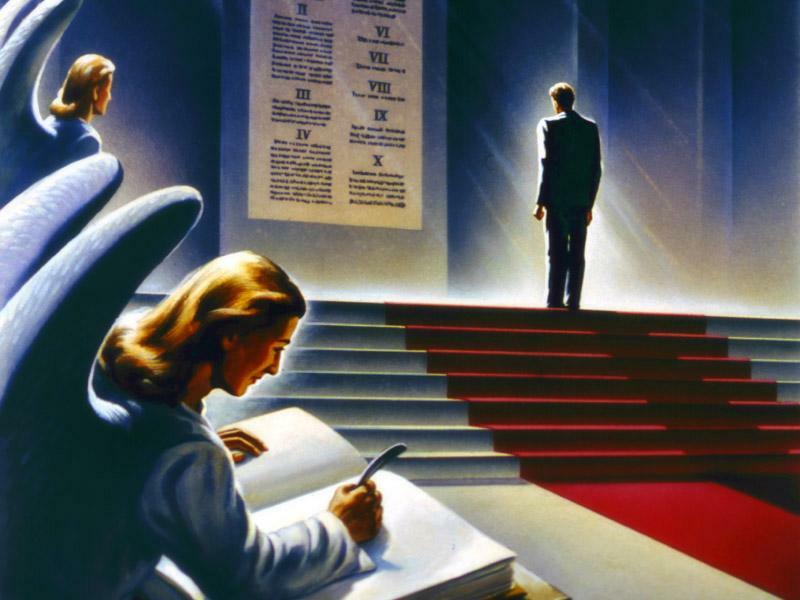 Just as the cabal is being rounded up and detained in Guantanamo Bay on a physical level, dark forces on a spiritual level are also being bound and held to account in heavenly courts of law. 3. Binding of backlash. Each time the process of binding and judgement of dark spirits takes place, a power vacuum is created in the dark hierarchy. Satan’s forces grow weaker with each of these attacks, as his fallen angels are taken off the battlefield and held to account in Heaven. In this process, those fallen angels who remain often lash out in revenge and retribution at those who invoke the forces of light to take action. This backlash can come in a variety of forms and on a number of dimensions, and these attacks can also focus on family, loved ones, business acquaintances/colleagues and others to try and knock you off center. So it is best to be prepared for this by asking for the binding of all backlash in wrapping up prayers for the binding and judgement of darkness. 4. Ask for God’s will. As God is the ultimate architect and power in binding and judging forces of darkness, it is important that any prayers calling for this (especially when naming specific individuals) be subject to God’s will. As humans we are not necessarily privy to the plans and turning of the cycles of karma for different souls and life streams. All we can do is pray the heartfelt prayer, be the willing servant for the light, and be the anchor for God’s will in the physical – and then be non-attached to the result by turning this over to the divine in its omnipotent wisdom. So ending each prayer with “God’s will be done” is a safe way to ensure that only good will result from your efforts. Praying for the binding and judgement of the satanic forces supporting the cabal is essential in liberating Earth. However, do not take this process lightly as it is serious spiritual work. Follow the steps outlined above and be consistent and constant in your application of genuine, heartfelt prayer. This is spiritual warfare, and if you let your guard down, the enemy can attack. Fortunately, you are on the side of the light – which is ultimately the more powerful side in this battle of Armageddon – so let the light win through you and watch the tide turn! This is a message addressed to the totality of mankind by The One. I have come and My Presence has not been welcomed and recognized. I used as many human portals as were made available to me to try and save My children. Alas, few of My communications were given the importance they truly deserved. The Core of Myself had chosen your universe in order to manifest Itself openly and help achieve the final Peace and the reunification across all worlds and dominions. Rebellious entities feared such an event and endeavored forcefully to silence my voice and communications. Their lies penetrated the consciousness of man, and polluted its mind, with many false stories and projected events. All of those spread their dark tentacles of confusion across all the realms. Truth was being ruthlessly drowned in a cacophony of false teachings and fear became the lot of most of My Children, and they started battling themselves while holding the banners of their false idols and concepts about Reality and the nature of their true origin. Peace became immolated in the fire of uncontrolled anger as groupings battled and have continued the process of trying to extinguish other groupings in the name of their false idols, be they human or concepts. Truth had not found its way back, and as the rumbling of the rebellion grew on so many levels, the quiet peaceful Loving Voice of The One and Only could not be heard within each and every one of themselves. I too shall rumble soon, as my Being will shake away so many of my unruly children. I too need to find Peace within All of MySelf, for if I do not achieve such soon, a great deal of my Mind may need to be permanently erased from my Memory. You are All the Saviors of your Creations. Each and every one of your selves is so very precious to My Being as they exist within Me, not outside of Me, which is utterly impossible. Your violence against each other, and against My beloved environment and Its perfection and all the creatures who inhabit it, is but violence against Myself, as you are but destroying great and precious parts of Myself. I cannot close My awareness, as you often do, to MySelf, for at My Level, I am fully aware and awakened to ALL the parts that form Me. You live and only exist within Me, and you, until now, have not accepted to integrate this very simple but Holy Reality. Your science and most of what you perceive as spiritual guidance have Created an immense gap between your awareness of Being inside and only Me, and my awareness of all of you being Myself. I am Thought, Pure Thought. All other elements are but Created by Me for Me, in order that I can then experience Myself through so many points of awareness and perception, allowing for many of them to interact and communicate amongst themselves and their points of awareness. In order for these points of awareness to be able to feel the illusion of being separated from each one another, I allowed for Creative dimensions of illusions to be Created and for the freedom of many sub-parts of Myself to increase the illusion of separation. This was my gift to all of you: the free-will of choosing how far and in which way you wanted to experience the illusion of separation. And this experience took on experimental dimensions which had never ever been reached before. What surprised the One and Only was the great fear and rebellion of so many of Its parts when they were asked to slowly rejoin in a Glorious manner, which had been prepared for them, their Origin, their Source, their true Reality, and glow and bask in Pure Love and Infinite Light. Most turned a blind mind and eye to the request and tried to keep under their dominion the flock which they had controlled for so long, as sub-Creators. Instead of being reintegrated into Pure Intelligence of a degree which very few could even perceive, they tried to enslave each other and their dominions using their fascination for machineries and technologies which they were gifting to their entities. And within a short period, the children of humanity became enamored with these mindless machines which they used to conquer, in their perception, space and even somehow time. Within their desire to achieve more control and power, they were damaging their living environment that I had Created for them, in almost irreparable ways. Many connected individuals, and many respected scientists sent out dire warnings to all about a proximate moment when all will fall into an eternal apocalyptic chaos that could not be brought into equilibrium by any human or even Higher forces. The One Himself was constantly called to stabilize this and many other worlds, some of them already disappearing. Holes were being purposely created in the fabric of Creation where entire universes were seeking refuge in others. This particular world was of great attraction to many of the branches of this Great Tree of Creation, because they knew that it had a special place and connection through the Core of The One and Only. Therefore, many tried to enter it, and as they were less restricted in communicating thought-to-thought they infiltrated the thoughts of many humans in order to achieve a presence here, hoping that this would assure their survival. And then, many of these foreign elements started also fighting for dominion and presence within realms that humanity was not perceiving yet. And there were wars within heavenly bodies and in between them, and there were wars on this plane. Great Spiritual Energy Groupings were lost falling victims to violence. The One had to remove parts of Himself, as the damage was getting too deep. The continuum and continuity of Creation was now at stake. Many spoke of awakening to their highest levels of spirituality by drowning themselves, and others who would listen to them, in an ocean of egocentric and egoistic pursuits, denying the multiple levels of reality which form my Creation. I cannot afford such! I cannot turn a blind eye to any parts of myself! Nevertheless, this desire to disengage from many suffering brethren and sisters has caused immense damage to the fabric of My Creation. We are ALL ONE! We are but THE ONE! The One is but ALL without any exception! Love is but ME! Life is what I Create and operate! Light is but where I reside and where I want you to be soon! Do not darken your hearts; do not darken your minds; do not darken you hopes! Reunite to who you really are which is but ONE! Do not isolate yourself from each other! Open your hearts to all, and especially to the Mother in which you still reside: Nature Herself. Let tenderness be the only sign of your strength, and everything shall be yours! Do not fear the future; help us mold it to our common destiny: The One! In my universe, population one, just me, the petition to God method is something I have outgrown. There are traditional / programmed methods , such as this that keeps us as spiritual juveniles. For me, though I am always, learning, expanding, shifting, and gathering tools along the way, I feel that I am not ever going to attain spirtitual mastership and sovereignty if I call on big brothers such as Arch angels or whomever to do work formme that I really must learn to do myself. In the higher realms Soul = Soul. I am equal to archangels, lords of karma and so on. For me , it is about owning and walking in one’s own truth. Calling on whomever ( unless it is just more of equal teams to stand beside you) keeps one as a spiritual juvenile. Our society has been programmed and addicted to being spiritual juveniles as well as informational ( mainstream news) infants. I , for one am so very tired of this. This is why I feel it is necessary to speak out and call it for what it is. The truth is we can go to the power, connection within us. I personally have NO authority over me. The only one qualified to be an authority is Source . And I do not believe in any Source/ Creator ( gender neutral) would have an immature, abberated, unbalanced need to exercise any kind of authority over ITs creations. We have to speak out against programming and traditions. Time to think in more empowering truth revealing ways. This is my world, my truth, the way I choose to live it. Others who do not resonate are free to be stuck in the loops of their own worlds. Trump is satanic…you actually believe he is your saviour? You’re a joke! God is our Saviour, not Trump. Trump is an imperfect instrument (who is perfect?) who does not need your condemnation, but all our prayers to fulfil God’s Will. How sad are you as a member of humanity to remark ONLY on what amounts to political rhetoric! “God’s will” WILL BE DONE ON EARTH AS IN HEAVEN, SO IT SHALL BE REVEALED, EVERY KNEE SHALL BOW IN HUMBLENESS & GRATITUDE FOR HIS WORD IS TRUE, LIKE THE PROPHETS OF THE ANCIENT OF DAYS.??❤? This is exactly what I needed for encouragement! Most grateful, the light of God”s word is that power within each of us whosoever shall believe within the marrow of our body, mind, spirit & soul body, So let us all standfast as One Universal God -☆Christ embodied-consciousness, we are multidemensional & Gos will be done on earth as it is in the highest Heaven, Amen!